a) Carbon dioxide is a minor player in any further warming. It is uniformly distributed in the atmosphere but only absorbs infrared (heat) in a very narrow wavelength range. 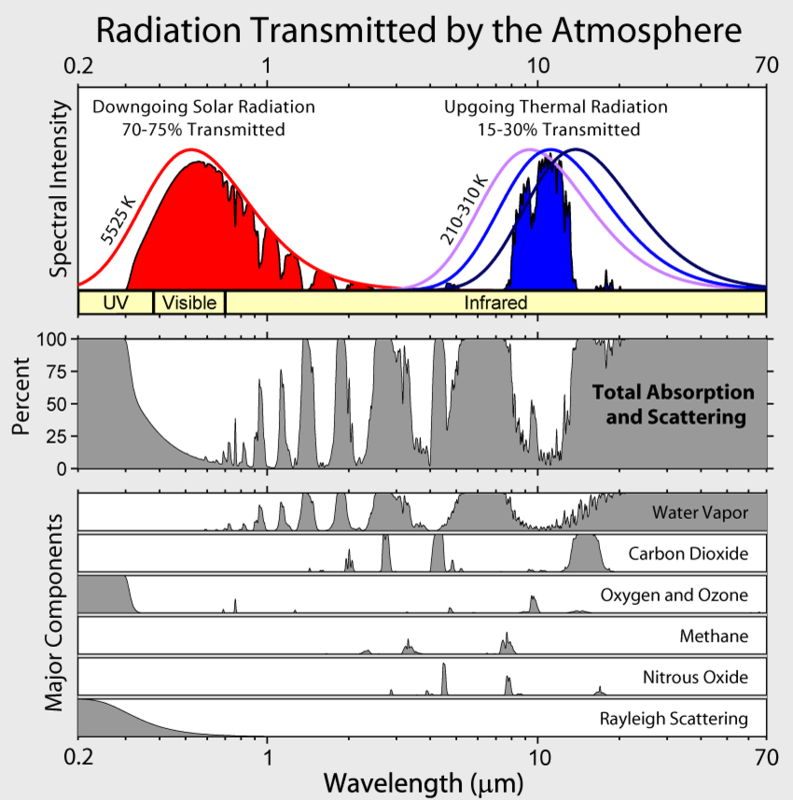 The CO2 wavelength range is outside the range of most of the solar radiance that penetrates our atmosphere. It falls roughly inside the wavelength range of temperatures re-radiated when solar radiation heats the earth’s surface. The atmospheric CO2 already absorbs almost all of the radiation that it can in that range. Most of the warming effect of CO2 has already occurred in the past and is one of the reasons our planet is not a frozen wasteland. Any increase in CO2 will have a very minor effect. With CO2 absorption near saturation, almost all of the re-radiated heat in that wavelength range is already being trapped, so it can have little or no effect on future increases in temperature or supposed forcing of water vapor. With CO2 essentially eliminated as a source, any increases in temperature must be from some other source. For a current example of philosophy and/or politics disguised as science, we need look no further than the climate change debate. Regardless of the merits of the case for the Anthropogenic Global Warming or AGW theory that manmade carbon dioxide is the cause of climate change, the way it has been advocated is more akin to a political campaign than to a dispassionate search for truth. Political action is advocated that would drastically change our world, crippling industry and technological progress while leaving developing nations to flounder in their poverty. The two pronged approach of this philosophy is to curtail both technology and population. Developed countries are said to hog all the resources at the expense of developing countries. People are said to be the problem, and advanced societies must be brought down to near subsistence levels while primitive societies are not raised from their squalor. But is any of this true? Is it science or is it politics? Unfortunately, it is more about politics, philosophy and belief than about science. Are there too many people, and are subsistent societies cleaner and less ecologically harmful? Are developed nations really hogging all of the resources at the expense of developing ones? The answer to each of these questions is NO. Appeal to authority, (a logical fallacy): the “consensus of scientists” with only a very small, elite group deemed qualified to understand or comment on it. 2. Appeal to ignorance(a logical fallacy): It must be increasing CO2 (Carbon Dioxide) because we can’t find any other cause – but we aren’t looking very hard at things like wind and water cycles or solar activity. 3. Depend on statistics and computer models instead of real historical facts and experimental data. Remember GIGO – Garbage In, Garbage Out. A model is only as good as the data used or left out, the type of mathematical calculations based on that data and assumptions and conclusions made. 5. Use guilt and shame to get people, governments and industries to “go green” and curtail the activities that use fossil fuels or otherwise emit CO2. Do you use incandescent light bulbs? Then you’re killing the planet because you’re consuming power from fossil fuel driven power plants. The government must phase out incandescent light bulbs in favor of LED or compact fluorescents, (which contain mercury, a primary pollutant); we must regulate power plants to insure maximum efficiency regardless of increased cost to the consumer, which hurts the poor most. Do you eat beef? You’re killing the planet because of methane from cows. The government must regulate the methane from cows. Do you Fly, drive or use a ferry or train? You’re killing the planet because of fossil fuel consumption. The government must demand more efficient transportation – even if CAFE standards demand lighter and less safe vehicles that are killing people. Do you use manmade fibers or plastics in any form? You’re killing the planet because it takes fossil fuels to produce them – never mind that most of these things get put in a landfill, which is a form of sequestering carbon. The government must regulate the industries that produce them – and the landfills, too. Do you use paper products? You’re killing the planet because trees that could consume CO2 are cut down to produce paper. Never mind that trees are farmed and harvested and new trees are planted to more than replace those used. Younger trees consume CO2 at a faster rate per ton than older trees. Present a parade of “experts” and dire predictions as absolute settled facts, not as projections of a computer model. Sensationalize and exaggerate any “fact” that supports the global warming theme and downplay or fail to report on things that don’t. Declare that the polar bears are drowning because the sea ice is melting. Never mind that polar bears can swim up to 60 miles between feeding areas, that there is no net loss of sea ice over time and that polar bear numbers are increasing. Have a storm, flood or drought? Blame it on Climate Change. Make it sound biblical in proportions and the worst in history. Have a problem with mosquitos because of a particularly wet spring? It must be Global Warming. Are the seas rising at the same rate they have been rising for centuries? Oh, my God, our cities will soon be underwater and we’re all going to drown! 7. Demonize anyone who disagrees as “deniers” with the unspoken implication that they are on a moral level with holocaust deniers. Climate experts that aren’t on board with the whole global warming scenario and who have DATA to back it up are called “just weathermen” who are unqualified to comment, even though many of them have better credentials than many of the AGW proponents. 8. Exclude from publication or grants, any research that doesn’t agree with their conclusions, and then declare that there are few peer reviewed papers on the other side. Never mind that government funding is overwhelmingly on one side. Journals such as Science and Nature have become advocates instead of unbiased scientific publications. 9. Hide raw and analyzed data and analysis methods from other researchers who wish to verify the work. Real science always shares data and methods with other researchers so their results can be verified. This one includes the “massaging” of the data to say something it doesn’t. The Climate-gate scandal was all about hiding the data and massaging it to eliminate the Medieval Warm Period and the Little Ice Age and to create a “hockey stick” that was used to alarm governments into drastic control measures. When other researchers finally got hold of the (massaged) data and analysis methods, it was discovered that any random set of numbers, when plugged into the formula, produced a similar “hockey stick.” This showed that the analysis algorithm on which the computer models were based was worse than worthless. Comparison of graphs published by earlier and later versions of the IPCC Assessment on Climate Change. Note that the later graph eliminated both the Medieval Warm Period and the Little Ice Age. Source: http://wattsupwiththat.com/2010/03/10/when-the-ipcc-disappeared-the-medieval-warm-period/ Note also that the vertical temperature scale is less than a degree above and below today’s temperature, which is set near zero on the graph. Manmade global warming or climate change as it has come to be called is said to be an established fact, and the consequences are dire unless global governments act now to mitigate its effects. The polar ice caps and glaciers will melt away; the oceans will rise and drown coastal and island regions; droughts, floods, storms and temperatures will all increase and millions, dare I say billions, will die. But is any of it true, and is it science? The answer is NO. While there has been general warming since the “Little Ice Age” of the 17th and 18th centuries overlain with periods of lesser heating and cooling, is the change good or bad? Is it unusually rapid now and will these alleged trends continue into the future? Is it extreme enough to cause the dire effects predicted and should global governments act now to prevent the predicted disastrous consequences? It is important to know if these modeled projections are reliable predictions and if real, is real science involved in any meaningful way. What do we really know about it? CAFE Standards are Corporate Average Fuel Economy Standards first mandated by Congress in 1975 during the energy crisis. These standards have been continually tightened for even greater fuel efficiency. The result is lighter, smaller, less protective and less safe cars that are contributing to highway crash deaths. Seas have been rising since the Little Ice Age in the 17th and 18th centuries at about 7 inches per century. Raw data was actually destroyed to prevent others from getting it through a Freedom on Information request.